The ok weather continues, so it's off to north Cumbria, to Waterfoot Park, Pooley Bridge to be exact. A site we haven't been to for a couple of years, but which used to be one of our favorites in the days before we joined the C&CC and CC. It's still a pretty good site, just not in our top five anymore. All of the pitches are serviced now, which is great, but they are quite small. It is becoming quite normal for us to reject our allocated pitch and ask for another, which is what we did when we arrived. We liked the look of pitch no. 16. After setting everything up, and lunch, we drove into Penrith to have a look around and get some supplies from Booths. There is a new pub in town - Dockray Hall, owned by Cumbrian Legendary Ales, brewers of Loweswater Gold and Langdale amongst others. We really liked it, but couldn't stay for more than one drink as we were in the car. In the evening we walked into Pooley Bridge, the plan being to have dinner in one of the pubs, only to find our favorite of the three temporarily closed. We had a quick drink in the Pooley Bridge Inn and then decided to get the last bus into Penrith instead. It was only when it was 15 minutes overdue that we noticed Sat/Nsch next to the time! A bit dispirited we headed back to the site, for dinner in the caravan and a night in. 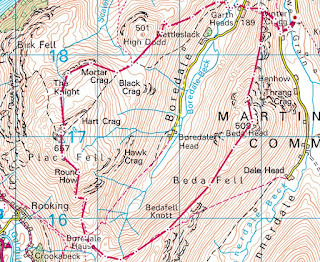 Two Wainwrights today as we struggle to reach our target of 107 by the end of the year. Beda and Place fells from St Martins church in Martindale, a great place to start and finish a walk. The church is about 750 years old. A 1300 year old yew tree in the grounds! 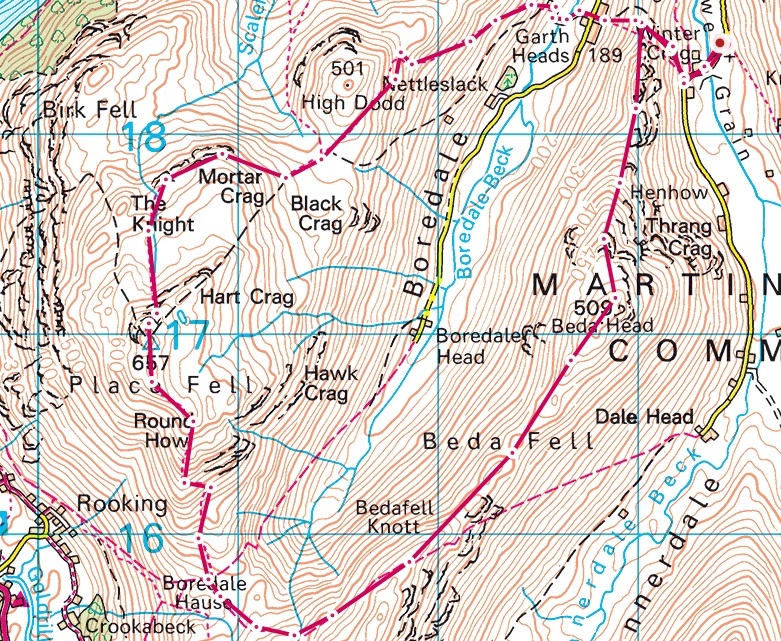 Beda fell first (509 metres). We decided to have another go at getting a bus into Penrith later, and had no trouble this time. We had what turned out to be a very expensive dinner and drinks in Dockray Hall, but it's true what they say...you get what you pay for! Pigeon breast and venison loin for D, pork and venison pate and chicken and chorizo for J. Very well presented and very tasty. Excellent beer too, and a plum gin and tonic for J. The taxi journey back to the site wasn't cheap, either! Back at site we weren't ready for bed, so had more drinks in the on site bar. It's in an old mansion house and much better than most on site bars, plus it's the only place on the site with wifi, which we took advantage of as we had no signal anywhere else in the area all weekend! In the morning we drove into Penrith, stopping off at a not very busy car boot sale on the way. We bought some new mugs and bowls from a charity shop and resisted the temptation to pop into Dockray Hall. In the afternoon we drove to Haweswater, hoping to catch sight of the last remaining golden eagle in England, but there were notices everywhere saying that it hasn't been seen this year and is presumed dead! Very sad. We wandered around the reservoir for a while. It is still one of D's favorite places, just not in the top 5 anymore (like the site). The water level was quite low. In the evening we walked down to Ullswater pier for a very reasonable sunset. After dinner in the caravan we wandered up to the mansion house, but it was empty apart from the barmaid (who was busy knitting). We stayed for one drink, just long enough to download last weeks Archers omnibus which we listened to in the caravan later. We left at 10. It was quite breezy on the M6 to begin with, so the journey home wasn't very pleasant and took longer than it should have, but we made it in one piece. The caravan is being service next week, but we hope to get away again at the end of October, weather permitting. Good as always keep up the good work.